When it comes to summer on Long Island, finding a spot to dine al fresco—one with good vibes and gorgeous views—is the name of the game. The glistening sight of the Long Island sound is reason enough to come to Old Mill Inn on the North Fork. 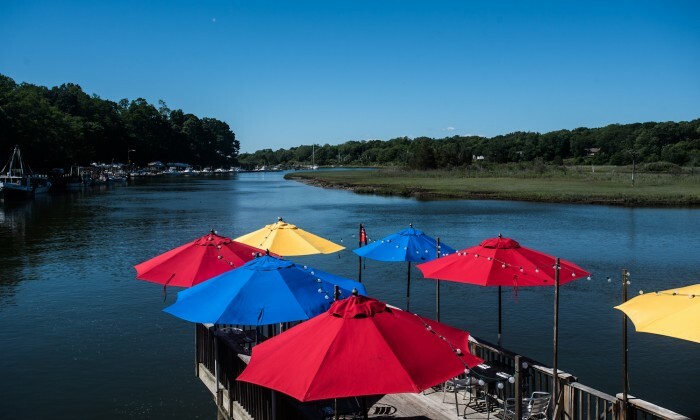 Add in a menu that emphasizes Long Island ingredients, all-day dining from noon-9pm, live music and the option to sit at the beach, on the deck or in the dining room or pub area and you’ve got more than enough reasons to become a regular. 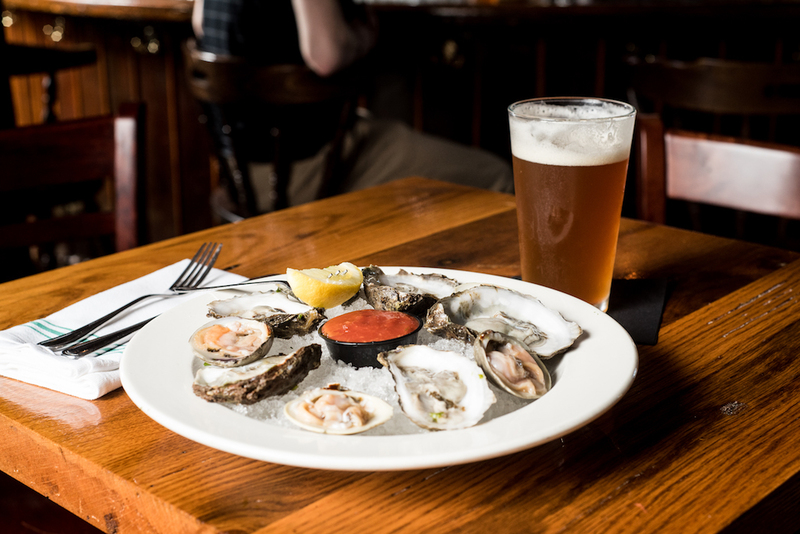 Pull up a seat, stool or boat and know you can’t go wrong with five food-and-drink pairings hand-picked by the customers. A hearty meal is nice, but come summer sometimes our comfort-food cravings diminish. After all, views like the one of Mattituck Inlet you get on The Deck at Old Mill Inn are enough to put us in a serene state of mind. 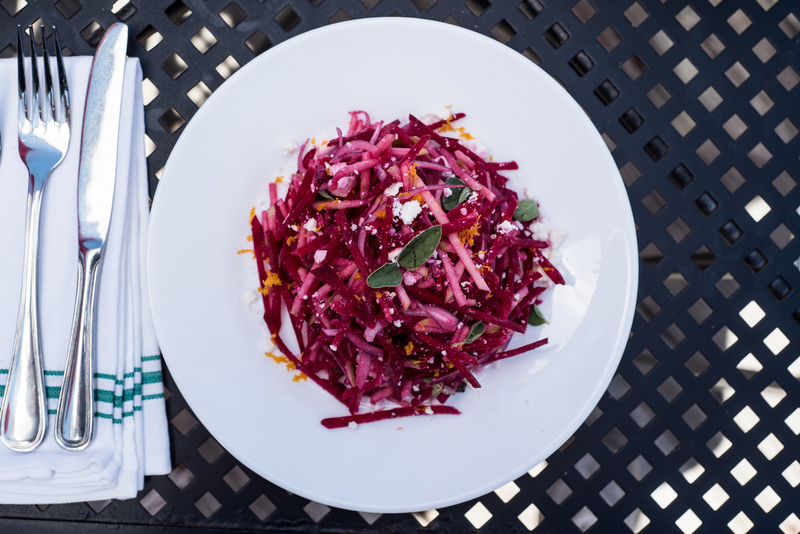 When you’re in the mood for lighter fare, nosh on a Beet Greek Salad at a table with a brightly colored umbrella on the deck. This is no bland plate of greens, either. Raw beat, granny smith apples, red onion, oregano, feta cheese and red wine vinaigrette have the salad bursting with fresh flavors, and the addition of grilled chicken, shrimp, salmon or tuna ($7) will give you a satisfying protein fix. 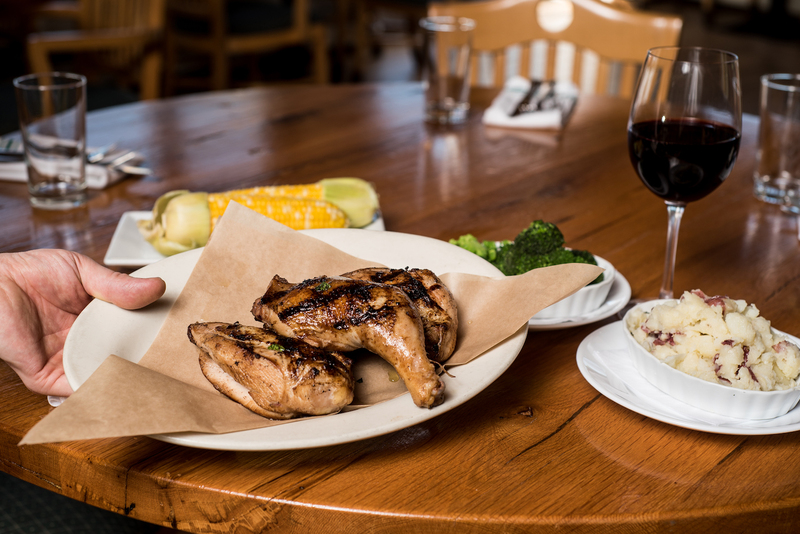 A fresh, crisp glass of white North Fork wine like Lieb Cellars Pinot Blac pairs perfectly with the lighter dish. Light wooden chairs and amazing views make The Dining Room at Old Mill Inn ideal for taking mom or indulging that special someone. 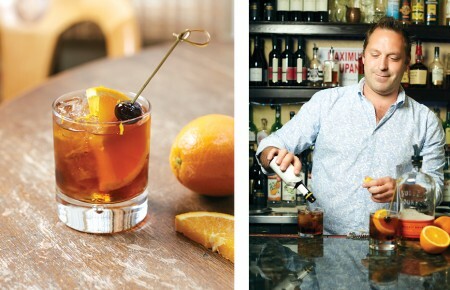 The food is delectable, and the atmosphere is as unpretentious as the North Fork. Ask for your favorite backyard party meal, chicken with corn and veggies (and if it’s your cheat day, order that chicken fried). Straight forward but delicious, it goes wonderfully with a glass of neighboring Shinn Estate Vineyard’s Mojo that’ll help you wind down after a long day. Rumor has it red wine is just as good for you as an hour at the gym. On Sundays, light acoustic music plays at The Beach but other than that owner Bia Lowe likes to keep the area quiet, allowing the North Fork waters to provide the ultimate soundtrack. Whichever day you choose to enjoy some easy listening, put a nostalgic spin on things by ordering a clam bake for two. 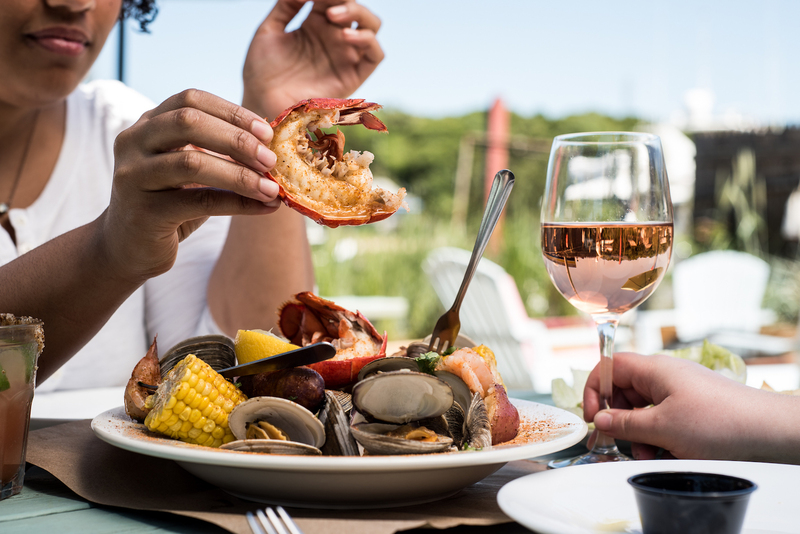 A dish made for sharing, the clam bake includes 12 littleneck clams, lobster tail, unpeeled shrimp, red potato, corn on the cob and Andouille sausage and will have you remembering beach days with Dad. Old Mill Inn is family-friendly, and that includes your dog, so give the pup a small taste of sausage, order some sodas in sippy cups for the little ones and get reintroduced to summer’s favorite vino: rosé. 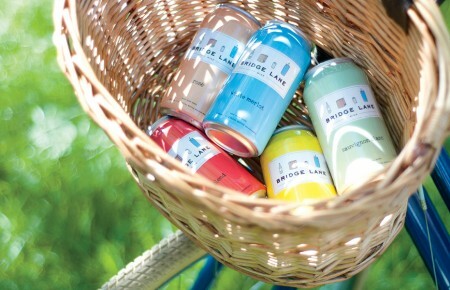 North Fork winery Bridge Lane’s is for the sipping. No, that’s not a typo. In the “things you didn’t think you’d ever see again after you graduated college” category, Old Mill Inn offers a $3 happy hour weekdays in The Pub or at The Beach. Sip local beer and wine from Crooked Ladder Ceiling and fellow Mattituck residents Eastern Front Brewery, Lieb Cellars and Bridge Lane. If you’re in a cocktail state of mind, opt for a Guava Margarita with chipotle sea salt on the rim as you eat the fish of the moment, oysters, or switch it up by ordering clams for $1. Yes, really, $1. Dining outside is quintessential summertime fun, but sometimes the elements just aren’t in your favor or, in the case of Old Mill Inn, the live music on a Friday night is just too good to pass up. 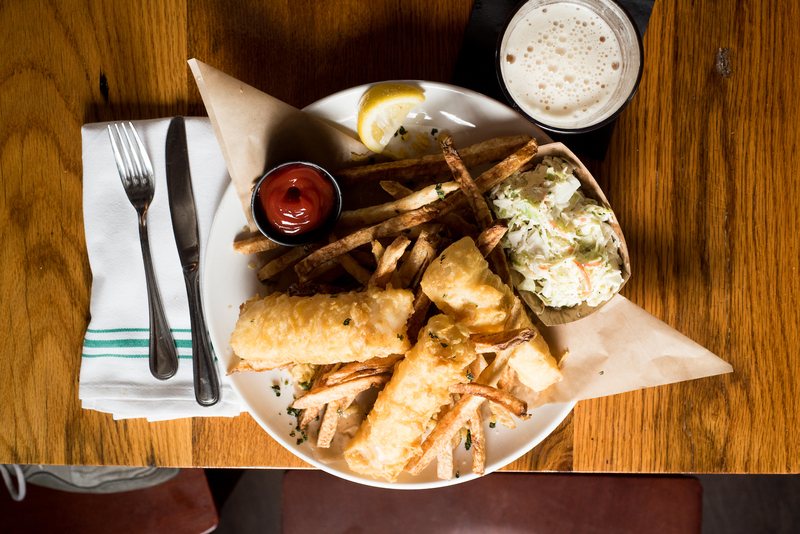 Whatever your reason, pull up a stool at The Pub bar and order yourself some fish and chips. At Old Mill Inn, the classic pub dish comes complete with generous helpings of slaw and fries. Beer is the obvious drink pairing, and you’ll have plenty of options to choose from like Murphy’s Irish Stout or Stone Delicious IPA, which is low in gluten. Hungry? Get in touch with the North Fork favorite at oldmillinmattituck.com or by calling 631-298-8080.